A team sprint world title and a superb Commonwealth Games campaign marked the highlights for New Zealand cycling in 2014. 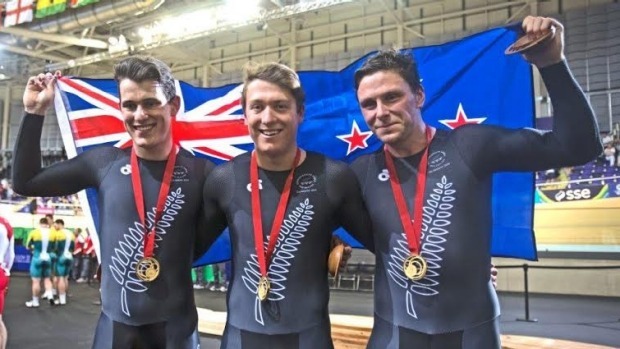 The trio of Ethan Mitchell, Sam Webster and Eddie Dawkins set the tone at the world championships in Cali, Colombia, in February when they set a New Zealand record of 43.065 seconds and then went on to beat a powerful German combination in the gold medal final. It was New Zealand's first team sprint world title and the culmination of a programme which had previously delivered bronze and silver at world championships level. At Cali there were bronze medals to Simon van Velthooven in the 1000m time trial, the men's team pursuit and a breakout silver medal for Tom Scully in the points race. With the Rio Olympics looming in two years' time, the Commonwealth Games in Glasgow was seen as an important marker for the New Zealand track team, in particular. Over four days at the Sir Chris Hoy velodrome, the black skinsuit was prominent, with Sam Webster's three medals turning him into a national star. The men's team sprint asserted their dominance, while Webster also won the sprint and took silver in the keirin. Eddie Dawkins won bronze in the sprint and New Zealand took silver and bronze in the 1000m time trial through van Velthooven and Matt Archibald, respectively. While the sprinters were grabbing the limelight, the endurance riders made a late arrival at the medal party. There was some disappointment in the bronze medals won by Marc Ryan in the individual pursuit, and the bronze medal by the team pursuiters, but the mood amongst the endurance programme lifted when Scully (points race) and Shane Archbold (scratch race) both claimed gold medals on consecutive nights. Aaron Gate, who had missed out on a ride in the team pursuit after a training injury, won bronze in the points race. In all, New Zealand won 11 medals at the velodrome, easily the country's most productive sport in Glasgow. When the attention switched to the mountainbike course, New Zealanders were treated to a riveting battle between young riders Anton Cooper and Sam Gaze. Cooper's year had been affected by illness and he had lost the national championship to Gaze. Together with Australian Daniel McConnell, the three dominated the event before Cooper proved too strong in the sprint finish to win gold and consign the largely unheralded Gaze to silver. Linda Villumsen, who has so often had to settle for one of the lower spots on the podium at international events, won gold in the road time trial, while Jack Bauer claimed silver in the men's road race, noted by the absence of many top Kiwi riders. The only disappointing aspect of New Zealand's cycling campaign in Glasgow was the lack of productivity by the women's programme, following a post-Olympics lull. BikeNZ came away from Glasgow promising to put more of a focus on their female riders and they have a number of willing riders eager to seize the opportunity. The question will be whether there's enough time between now and Rio for them to make up for lost time. The BMX programme was affected by serious race crashes to all its high performance riders. Kurt Pickard showed good mid-year form in the United States, and there was pleasing development from Trent Jones. Downhill mountainbikers continued to perform, with Sam Blenkinsop the pick of the bunch. He produced four top six World Cup finishes and was seventh at the world championships - the fourth straight year he's been among the top finishers.